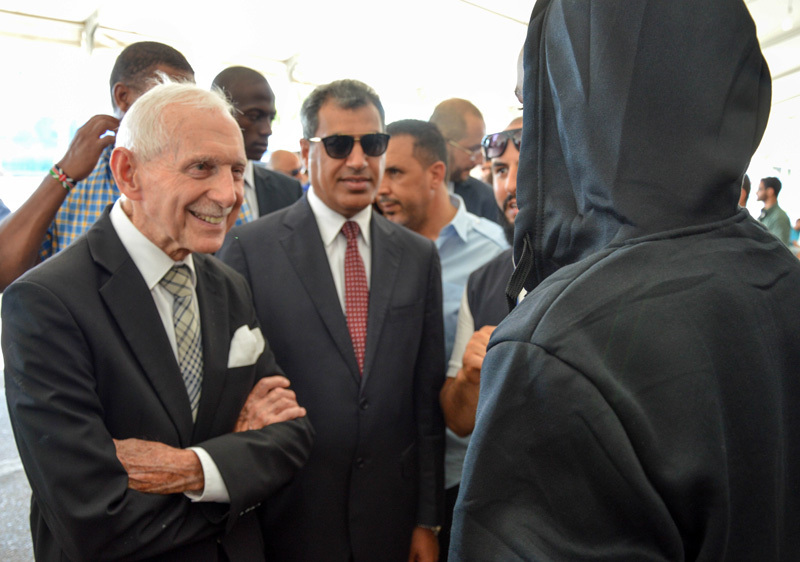 Tripoli – IOM, the UN Migration Agency’s Director General William Lacy Swing returned to Tripoli earlier this week (1-3/08), where he reiterated that Libya remains IOM’s top priority. In what was his second visit to Libya this year, Director General Swing along with Vincent Houver, IOM Deputy Director of the Department of Operations and Emergencies, Othman Belbeisi, IOM Chief of Mission in Libya and other IOM Libya staff met with the Prime Minister Fayez al Serraj. The IOM delegation also met with several Government ministers, as well as representatives of the Libyan Coast Guard and the Directorate for Combatting Illegal Migration (DCIM). “This visit contributed to strengthening the way IOM plans and works together with governmental counterparts to ensure the delivery of tangible results in support of the Government’s strategic priorities,” Belbeisi said following the visit. Whilst IOM’s delocalized structure is built on a strong field presence with IOM staff all across east, south and west of Libya, an increasing number of international staff is anticipated to be back in Libya as soon as possible. Throughout the Tripoli mission, IOM advocated for the improvement of living conditions in the detention centres and alternatives to detention including open centres and safe spaces for women, children and other vulnerable migrants, registration of migrants following rescue-at-sea operations and the continuous technical cooperation to support local partners and Libyan officials. During the visit, Director General Swing also met with, and wished 132 stranded migrants a safe flight home to Guinea Conakry. “I appreciate the help provided by IOM and I am so happy to go home, back to my family,” one of the children who received IOM’s family tracing assistance told Director General Swing. In order to reach IOM’s goal to assist up to 12,000 stranded migrants with voluntary humanitarian return assistance in 2017, close cooperation with representatives of the migrants’ countries of origin is key. IOM Libya invited all diplomatic representatives for an open discussion on how to further facilitate consular procedures. Director General Swing also met with the Deputy Special Representative and Deputy Head of the United Nations Support Mission in Libya (UNSMIL) Maria Do Valle Ribeiro, during which they discussed IOM’s scaling up and the continuous close collaboration with the UNSMIL. IOM Libya’s donor countries also received a briefing in Tunis, during which the outcomes of the Libya visit, programme developments and the way forward were presented.